This was the verdict of the Independent Review Commission on the 2007 Elections. The Commission, headed by retired South African judge, Johann Kriegler, presented its report yesterday to President Mwai Kibaki and Prime Minister Raila Odinga. The President and Prime Minister promised to discuss the report in the coalition cabinet in order to decide how best to reform Kenya’s electoral system. Supporters of Raila’s ODM party have expressed disappointment with Kriegler’s findings and insist the elections were deliberately rigged in Kibaki’s favour. However, during the Commission hearings, evidence emerged that all political parties committed electoral fraud within their ethnic strongholds. President Kibaki and Prime Minister Raila Odinga were the two top protagonists in the tightly-fought presidential race. After Kibaki was declared winner, supporters of Raila rejected the results. Riots and ethnic clashes, especially in the Rift Valley, caused the deaths of over 1,000 people and made half a million homeless. International peace talks led by Koffi Annan resulted in a coalition government, with Kibaki keeping the presidency and Raila appointed to the new post of Prime Minister. Johann Kriegler’s Commission of Inquiry was formed as part of the peace talks to analyze what went wrong with the elections. According to Kriegler, the Kenyan people need to change the way they view and conduct elections. “Even if you fired the entire Electoral Commission of Kenya, and you appointed new people to conduct an election under the same circumstances, they will fail,” Kriegler has been quoted as saying. While the casting of ballots proceeded smoothly, vote counting ruined the credibility of the polls. In many constituencies, incomplete results were declared. In other constituencies, election clerks were hired the day before the vote and sent to work without training. However, political parties were also to blame as each thought it would get an advantage by influencing the employment of clerks. Final tallies were misinterpreted, there was too much pressure from political parties while, on numerous instances, people were allowed to vote more than once. In Kibaki and Raila strongholds, police officers and election observers were removed from polling centres which went ahead to, “declare” results. Voters who queued for hours will be dismayed to learn that elections officials simply made up the final figures. The Returning Officer for Changamwe Constituency confessed to announcing wrong results because he was tired and hadn’t slept for three days. But the worst revelation came from a Returning Officer from Kirinyaga Central who admitted before the Commission that the current Member of Parliament for the constituency had infact lost the election. Meanwhile, the Electoral Commission of Kenya spent thousands of dollars buying 210 laptop computers to assist in the tallying of election results. The computers were never used. On its part, the Electoral Commission has blamed politicians for piling excessive pressure that disrupted its election procedures. Many constituencies had at least twenty candidates vying for the legislature and dozens for local authority seats in addition to at least ten presidential candidates. Since electoral law states that all party agents must assent to the final count in each constituency, getting unanimous agreement among the many agents and observers proved impossible. Preliminary findings from the Kriegler Commission of Inquiry indicate that last year’s General Election failed due to incompetence by the Electoral Commission of Kenya and not because of a diabolical plot to rig the elections. Both President Mwai Kibaki and Prime Minister Raila Odinga were shortchanged in the vote tally. From evidence adduced before the Commission, its becoming clear that the true winner of the election may never be known. Final tallies were misinterpreted, there was too much pressure from political parties while, on numerous instances, people were allowed to vote more than once. In strongholds of the two leading presidential candidates, police officers and election observers were removed from polling centres which went ahead to, “declare” results. The Independent Review Commission investigating the 2007 General Election is a result of peace talks brokered by former United Nations Secretary General, Koffi Annan, in March this year. The Peace talks ended political and ethnic clashes that erupted following the election. At least 1,000 people died between December 2007 and February 2008. Half a million were evicted from their homes. The violence pitted supporters of Raila Odinga against those of Mwai Kibaki. The two men were the top contenders in December’s polls. Kenya’s Electoral Commission declared Kibaki the winner but Raila’s supporters rejected the results due to anomalies in the vote counting process. The Koffi Annan peace talks led to the formation of Kenya’s giant coalition cabinet. Kibaki retained the presidency, while Raila got the new position of Prime Minister. The Independent Review Commission is expected to establishing why the polls failed. 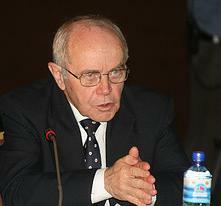 The Commission is headed by Justice Johann Kriegler from South Africa. Previous evidence at the Kriegler Inquiry has revealed that thousands of electoral clerks were literally picked off the streets and sent to work without training. However, political parties were also to blame as each thought it would get an advantage by influencing the employment of clerks. On its part, the Electoral Commission has blamed politicians for piling excessive pressure that disrupted its election procedures. Many constituencies had at least twenty candidates vying for the legislature and dozens for local authority seats in addition to at least ten presidential candidates. Since electoral law states that all party agents must assent to the final vote tally in each constituency, getting unanimous agreement among the many agents and observers proved impossible. Electoral Commission Chairman, Samuel Kivuitu, has criticized political parties for presenting conflicting lists of candidates. This, according to Kivuitu, contributes to confusion during elections. Since the disputed elections, Kivuitu and his team have resisted calls to resign, saying that their actions were lawful. Days after declaring President Kibaki as winner, Kivuitu was quoted as saying he did not really know who won the election.